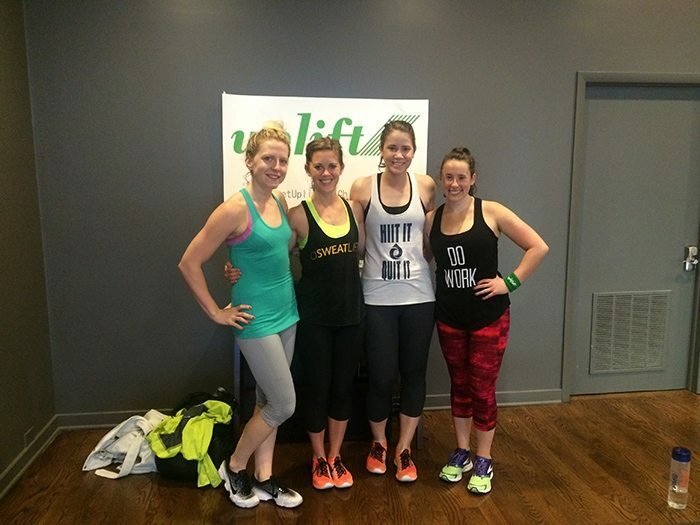 Last week, Kristen, Jeana and I were able to check out Uplift Studios, a new pop-up studio in Gold Coast that is planning to make an impression on women’s fitness in Chicago. Uplift is a women-only fitness studio focusing on strength training to get women off the elliptical and into a full workout routine. Uplift originally started at its successful New York location and has recently expanded into the land of deep dish pizza and friendly Midwestern faces. Kristen is somehow all smiles at 6:15 am. Teach us your ways. Sam’s strength class worked separate muscle groups for about 4-5 minutes each, switching up the exercises every 30 seconds or minute. For example, we would do 5-6 different exercises to work our arms for a total of 4-5 minutes and then switch to working out our back muscles. Knowing the class will only spend a few minutes on each muscle group encourages women to really test their strength and maximize the weight they can lift in the shorter period of time. The point is to push yourself, fatigue each muscle group and see how much you can get out of each set. Sam encouraged us to start with higher weights, noting that we can always drop down to lower weights if we felt that we needed to. Pre-class set up with a variety of dumbbell choices. We were encouraged to start off using heavier weights for most exercises, knowing we could always switch them out for a lower weight option or no weights. Uplift is currently working to build a community and make Chicago a new home. I caught up with Sam after her class to ask her a little bit more about Uplift Studios and its future plans here in Chicago. Cass: What sets Uplift apart from other studios/fitness options? Sam: Uplift is a women-only fitness studio focusing on making strength training accessible to women at all levels of fitness. Cass: How would you describe or explain a typical strength class at Uplift? Sam: During an Uplifting Strength class, you can expect to work for 55 minutes focusing on each muscle group for the duration of one song in the instructor’s playlist. Throughout the class there are two bursts of cardio to keep the heart rate (and sweat rate) up. Cass: Why do you believe that strength training is important for women? Sam: Women often don’t realize how important strength training is. Strength training not only makes you stronger and improves muscle definition and athletic ability, but it increases your resting metabolic rate (goodbye extra calories! ), improves bone density, and helps your lean muscle stick around as you age. In the short term, it will also make it a whole lot easier to open a tight jar of pickles! Cass: What are some of your go-to motivational sayings or mottos to push yourself or others through a tough section of class? Sam: My co-workers asked me this the other day and it was really funny/awkward to hear myself saying them quietly at a restaurant during dinner. Cass: What do you expect for Uplift in Chicago in the near future? Sam: We hope to build a community of women who want to get fit and strong in the company of other like-minded women. We plan to build our presence in the city, increase the number of classes offered, and incorporate different formats and special events. We’ve seen firsthand the excitement and success that comes when strength training for women is combined with a strong community from the Uplift Studios location in NYC. We are so excited to bring that level of empowerment to Chicago! From left to right: Jeana, Kristen, myself and our instructor Sam after our Uplifting-Strength class. Do we look jacked yet? 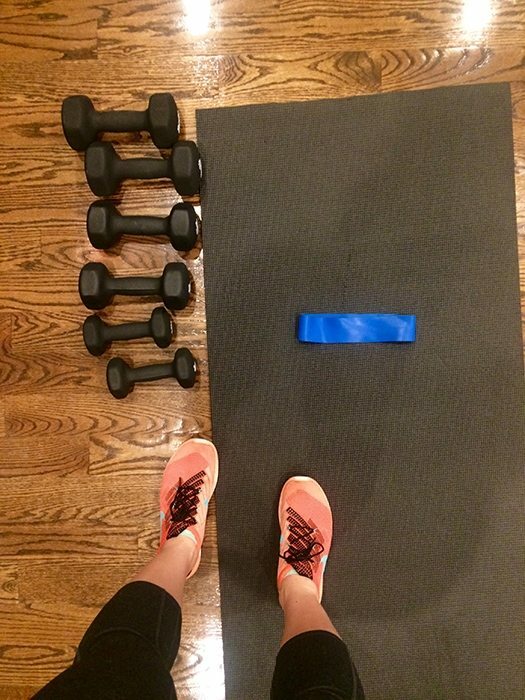 You can find Uplift on ClassPass or check out their class pricing here. With morning and evening classes on weekdays and Saturdays, Uplift aims to make sure everyone can find a class and time that suits their needs. 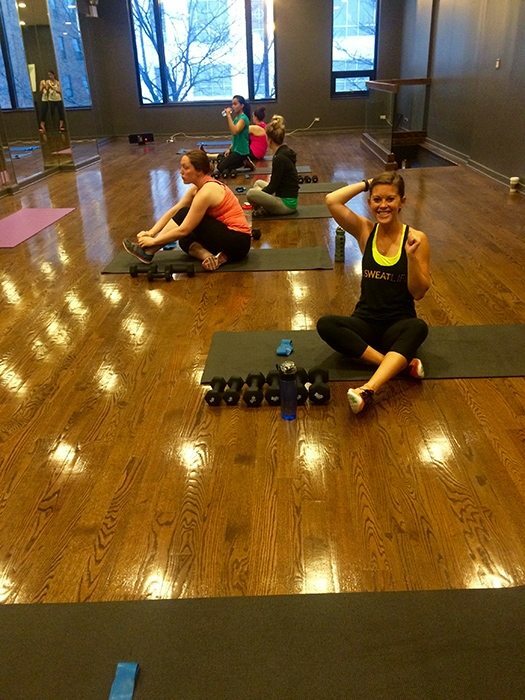 Gym: Uplift Studios, 735 N. LaSalle Dr.
Focus: These 55 minute classes incorporate dumbbells, resistance bands and body weight exercises to build strength and power. Class packs bring the cost per class down. First two classes for the price of one. Fasted Cardio: Friend or Foe?